Shamanic Retreats 2014 – Update from Almine! 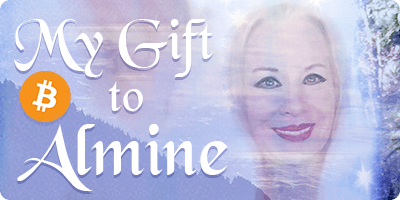 Today we share a personal message from Almine regarding the Shamanic Men’s and Women’s retreats in September of this year. After some really large signs while in Copenhagen, that I could not ignore, I have been able to understand some extremely large developments as the planet becomes a resurrected being. This includes the complete integrated function of masculine and feminine as the Ida and Pingala merge. All of this leads me to conclude that we are facing the unprecedented situation in which the Men’s and Women’s Shamanic retreats will be joined as one. The dates will be September 15-19, 2014, which are the dates originally scheduled for the Women’s retreat. I will be happy to reimburse the fees associated with the men’s flights so as not to inconvenience my beloved brothers as well as renting a beautiful home for them to stay in. There are tremendously exciting tools, techniques and revelations that we will be mastering during this retreat and I look forward to it enormously. The benefits for us as the major lightworkers on the planet will include: learning how to master matterless matter, so that we can achieve effortless manifestation through harmony with Infinite intent. Secondly, participants will begin to prepare their training as Masters of the Runes. In studying this deeply mystical body of information, they master the fertile power of inner space. I can feel the tremendous significance of this workshop and hope that you will listen to the message of your hearts to see if this might be the place for you. We hope to see you there! Note: The pages for both the shamanic men’s and women’s retreats will stay up on Almine’s store. If you want to join in you can do so through either one of those pages. I was dreaming about the Haaraknit and some kind of ceremony around It, all night long -I was waking up few times and the dream continued- and that was the very first day of the Copenhagen retreat…. Oh my, things are moving very fast! Yes, I have been feeling this as well and am experiencing it as it happens. I am the integration point, I am the pivot point, I am the door to everything. I am (t)here regardless of form. ALL LOVE, BLESSINGS AND PEACE TO ONE AND ALL!!! COSMIC SUPERHUG!! !